The first of the challenges to faith posed by M-Theory is the apparent randomness in the structures underlying the universe. The Grand Design takes a good hard look at quantum mechanics, and notes that the model that best represents the nature of subatomic particles suggests that they seem to exist everywhere they could possibly exist. Meaning, if a subatomic particle is moving from point A to point B, it does so in a straight line. It also does so in a curve. And a wildly squiggly and embarrassingly unfunny Family Circus kid-coming-home line. It also does so by way of taking a bus up to New York to see a revival of Cats, and then coming back. All of those options occur, but only one is observed. For subatomic particles, there's no one, simple, straightforward, deterministic path or location in space time. What ends up "happening" is completely unpredictable. This means, according to Hawking and Mlodinow's interpretation of the bleeding edge of physics, that our spacetime is fundamentally random. There is no design, because everything that has arisen has done so because of tiny random variances at the subatomic level, and their echoes in the larger visible structures of our universe. 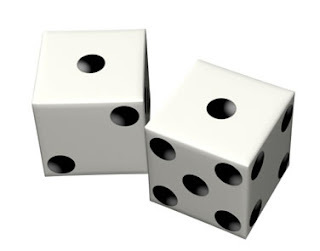 Einstein once famously rejected the idea of randomness at the foundation of all existence by saying," God does not play dice with the universe." Well, says Hawking, hate ta tell ya, but that's exactly what is going on. God does play dice with the universe. The whole thing's a crapshoot. So according to M-theory, everything is random, and could just as easily not have occurred. Therefore, one might argue, the existence of a Creator who has an intent for our universe or provides purpose and meaning in life can't be defended. It's just, like, totally random, dude. But here, Hawking seems to have forgotten the most revolutionary assertion of M-theory. The universe is not just our time and space. It is every possible time and space. It includes realities that may not involve time at all. It involves dimensions in which the laws of our physics are replaced by other, impossibly alien laws. It may even involve versions of our own space time in which Glenn Beck is a force for good, though that stretches even my credulity. Sure, God plays dice. But according to M-Theory, he rolls a one. And a six. And snake eyes. And gets a Yahtzee. And makes his saving throw against poison, even though he's only a level one magic user with a constitution of 5. A multiverse in which every potential possibility is by necessity expressed is cannot be described as random. It is, rather, complete. It is utterly thorough. Precisely what one might expect when an omniscient and omnipotent player sits down at the table to play.